Mark, The Sanctioned runs are Wed and Thurs. The shoot out will be on Friday. Sharkey, do you have the contact info for Hydra?
. Sharkey, do you have the contact info for Hydra? 2444 Ridgeway Blvd, Lakehurst, NJ 08733. 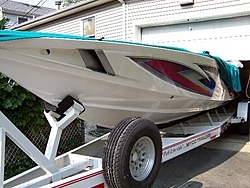 I also have a link to their website at SharkeyMarine.com listed under Manufacturers. I just spoke with Jack at Hydra. He doesn't have anything for a Kilo Run. He said if they had a class for the "Most Fuel Effecient" hull he could probably win that. Most of his customers wanted superb cruising distances and the boats were built for that. Extremely light weight, vacuum bagged epoxy/vinyl-ester built boats. He has had several right ups on his boats I believe in Yachting and one other mag for the performance. They all have great reviews and test results for their effeciency. Lately he has been doing some interesting things with the large Vee Hulls. There's one being rigged right now with Mercury's latest digital technology controls. So it looks like we should all be in for a surprise when that one's done! I wonder who this customer is??? He has done some amazing stuff. He is one of NJ's low-key boat builders that has the advancements of technology that all the top boat builders are utiliziing today such as Outerlimits. He can afford to do it for less only because his marketing budget doesn't come near to what the other boat builders are spending. With Hydra, it is mainly by referrals and the quality of the boats that he has built for the last 20 years. Still not one warranty claim to this day for hull failure. This is going to be awesome...if you ever really wanted to find out how fast your boat will go...this a must do event. Keep us posted with what boats are planning to participate. I wonder if we could possibly get the owner of the 32 Hydra to go down from Jersey for this?? ?